Biff Birmingham speaking at the Polly Hill Arboretum. In the Panama Canal the grand challenges facing the world are played out in miniature. Here freshwater management, deforestation, biodiversity and global warming have converged to pose economic challenges that the rest of the world may not face for decades. From his perch in the middle of the rainforest, Biff Birmingham, director of the Smithsonian Tropical Research Institute (STRI), has made this convergence the focus of his research. 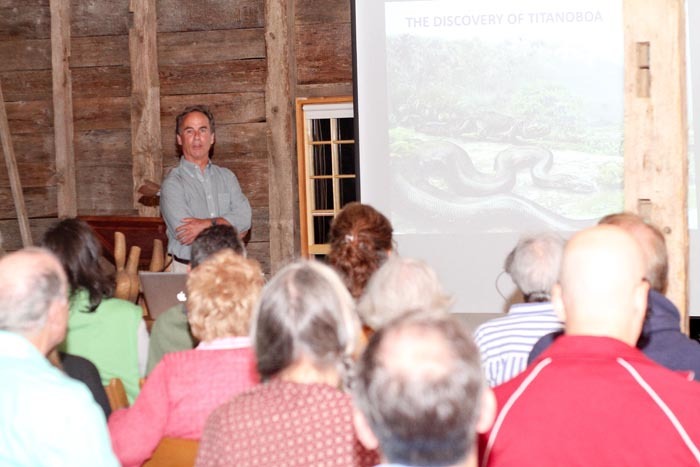 He spoke at the Polly Hill Arboretum on Wednesday night. “The Panama Canal is probably the best place in the world to understand the variety of services that different ecosystems provide society,” he said. Within the canal is Barro Colorado Island, a former riverside mountain, now a manmade island created when the waters rose 100 years ago to form Lake Gatun when the Chagres River was dammed. It is also Mr. Birmingham’s office; he calls the island the best understood tropical real estate anywhere in the world. Some 53 million gallons of critical fresh water is lost to the sea with every ship’s passing through the canal. With a dry season that lasts from mid-December to early-April, and the rest of the year a rainy season (the heaviest rains are between September and December), the ability of the landscape to regulate water is crucial. During the rainy season too much water entering the canal can cause flooding and damage infrastructure — Mr. Birmingham played a video taken by his son of giant floating patches of vegetation and trees slamming into a bridge over the Chagres River (for the first time in the canal’s history in 2010 it had to be shut down for 19 hours due to flooding). Too little water in the dry season and the canal can be rendered impassable — in 1997 dry conditions from El Nino dropped the water level in Lake Gatun so low that ships had to off-load at either side of the Canal to float higher in the water. Researchers at Mr. Birmingham’s institute monitored the landscape’s ability to regulate the flow of water from the 300,000-hectare watershed of the lake by monitoring two small dams, one serving a landscape that was 100 per cent forested and the other one that was 50 per cent deforested. The difference was dramatic. In the wet season the forested landscape retained water and prevented flooding. In the dry season it returned more precious water to the lake while the deforested area was bone-dry. In a passageway that handles five per cent of the world’s commerce at any given time, the health of Panama’s rainforests is not only of interest to biologists but to business as well. But those resources are being constantly undermined by economic pressures on the country’s underclass, for whom cattle grazing provides a more immediate economic benefit than conservation. He said the lessons of the Panama Canal could be applied to conservation efforts the world over. The health of the world’s rainforests will also likely play a crucial role in mitigating climate change. Old-growth forest can store as much as 50 times more carbon than pastureland, and it takes up to 60 years for successional forest to recover 60 per cent of its biodiversity and carbon-storing capacity. In an unprecedented 30-year, 50-hectare study of a plot of forest on Barro Colorado Island, Mr. Birmingham’s team has witnessed with surprise the ability of a forest — once thought a stable, unchanging ecosystem — to respond to environmental pressures. Mr. Birmingham produced troubling statistics indicating, somewhat counter intuitively, that growth rates in Panama’s forests were declining in the presence of increased carbon dioxide — perhaps because of increasing temperatures and longer dry periods. Writ large, the trend could have catastrophic implications for the world’s rainforests potential role as a so-called carbon sink in the face of rising CO2. In 2009 a paleontologist on Mr. Birmingham’s staff working in the coal mines of northern Colombia discovered titanoboa which, at 43 feet (longer than a school bus), was the largest snake the world has ever known. The animal lived 55 million years ago during a period known as the paleo-eocene thermal maximum. Temperatures in the tropics during that period were three degrees celsius above modern-day temperatures, and global carbon dioxide levels registered at about 850 parts per million. By 2100, this is where many climatologists expect us to be. “That’s the world we’re headed toward,” Mr. Birmingham said.